Of course I’ll start out with Wizard 101, my favorite game! I just hit level 30 and am making my way through the depths of Chelsea Court in Marleybone now. I’ve got multiple videos coming for Wizard 101, so I won’t talk too much about it – since that’s what pretty much this whole site is usually devoted to. I am still having a LOT of fun and I’m really, really looking forward to Celestia, which sounds like it’s coming pretty soon!! This is a Facebook game, and while I normally don’t get into these I have to say, I’m pretty well addicted to this one. I started playing because, well, it’s about monsters, and I’m a monster, so it seemed a good fit. The premise is simple – you create a backyard ‘habitat’ for various little monsters. 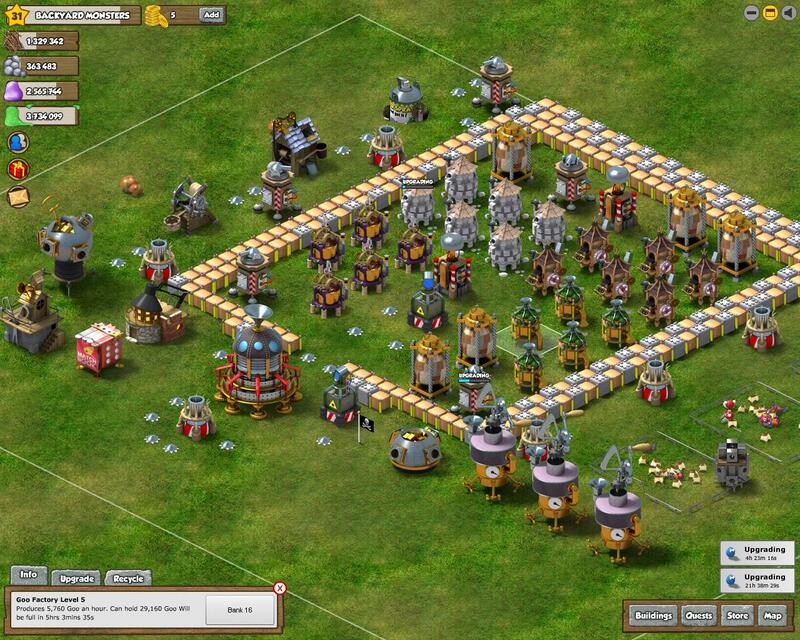 You have to harvest resources to build structures and defenses, like Starcraft, you have to plan out defensive towers and structures like a typical tower defense game, and you plan attack strategies to raid other backyards and take their resources. I’m level 31 now, almost level 32, and my strategy has been all about resource production and protecting those resources. The only buildings that an enemy attack ‘scores’ on are your resource harvesters and silos, so if you’ve got them well guarded, someone coming in and knocking over your monster academy or even monster housing doesn’t really count against you, it’s just annoying. Make sure you build up all your turrets, and use the yard planner – it shows you a great overhead view of your yard and – most importantly – shows your turret ranges so you can verify you have adequate coverage. This is another Facebook game that I’m only playing now because of serious puppet-related OCD I think. I’m level 112 and every day I log in for five minutes, do all the current missions I can, cash out my real estate money, put it in the bank, and I’m done. I think I’m only playing now because I want to get to the ‘end’ of the game – get through all the last quests. I’m on the last quest in the ‘Wizard World’ section now, and about to start the ‘closure’ section, which is for levels 100+. It was a lot of fun in the beginning, but I’ll be honest – it’s gotten boring. 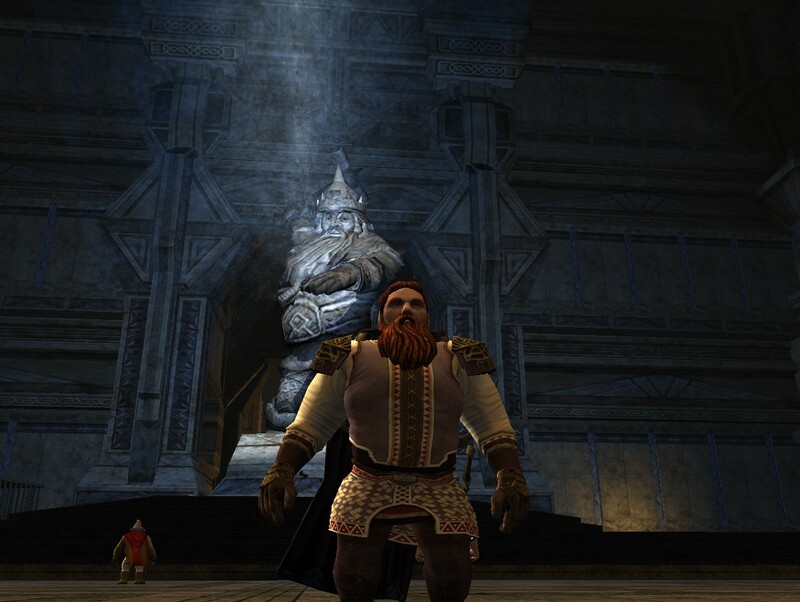 So yes, I have a LOTRO account now, a level 10 dwarf named Ditto. He has furry orange hair and a bushy orange beard, he’s great! The game is beautiful at average graphics settings and breathtaking at the highest levels, the sounds and music are amazing as well, and I think that’s part of my problem. When one of my first quests was to kill wolves, the wolves were beautifully rendered, well animated, and the super-realistic ‘hurt puppy’ whimper they made when I hit them with my axe was heart-breaking. When you defeat the wolf, it lays there on the ground, very obviously dead. There’s no blood, but still… It’s not like a gobbler falling over and melting through the floor when you defeat it in a duel. I think that the game is just so real, it certainly earns it’s ‘Teen’ rating. Yup, jumped into this one too. I’m trying to get the name ‘Ditto Monster’ for my avatar but all custom names have to be approved, so for now I just have a placeholder name. The game is amazingly cute and cool if you’re into Star Wars/Clone Wars, but it’s definitely NOT an ‘MMORPG’ – not that this is a bad thing, I just think some people assumed it was more ‘MMO-like’. 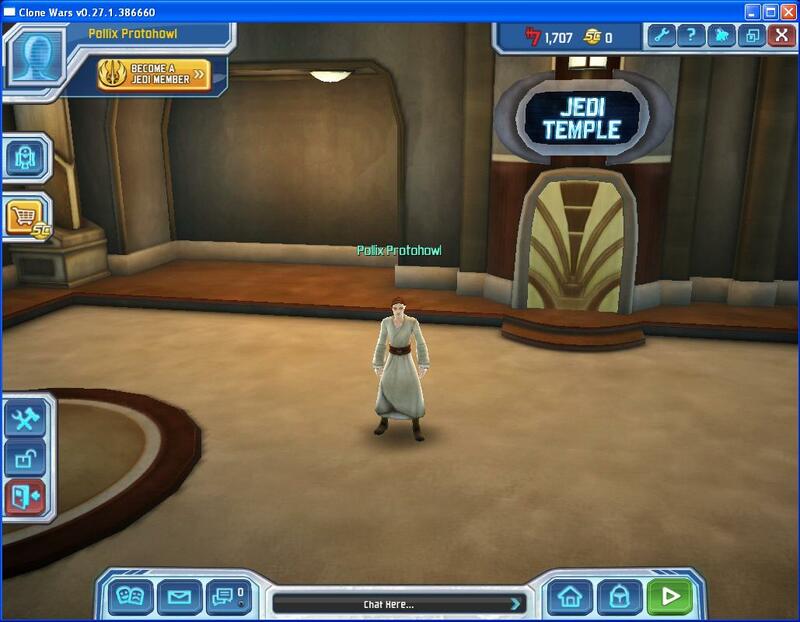 What you get with Clone Wars is a cool character avatar who can run around a space station and chat with other people, meet Star Wars characters, and play some really fun Clone Wars themed mini-games. That’s about it. The mini games are great, and some, like ‘Saber Strike’, are down right addictive, done in the style of classic Pop Cap games like ‘Peggle’. I’ve only just started Clone Wars, so I don’t know a lot about it yet, but it’s very kid friendly and the chat seems pretty safe so far, though again, I’m still a new. Installing was fast and straightforward too. My Clone Wars dorm room - very empty right now! Another Facebook game, I tried it because some of my FB friends were playing and it seemed interesting. Well – I don’t get it. Maybe it’s a Fabricated American thing, but this game confuses the fur off of me… It’s like you have dead pets and if you don’t feed them they get… deader? And if they ‘live’ you can, um, sell them to buy more pets to… yeah, I just don’t get it. Probably won’t be doing much with this one. So that’s it – my current games, what I’m playing right now. Naturally 70% of my time is spent in Wizard 101, it’s still my absolute favorite, but there are some other really fun – and free – games out there you can try. I’ll probably be giving some general updates on the other things I’m playing in between my Wizard 101 daring adventures and exploits! Until next time – PLOX!! This entry was posted on September 17, 2010 by dittowizard. It was filed under Fabricated American, Gaming .